It hurts when the team realizes that it is time to retreat, but nevertheless there are numerous ways to execute a successful retreat. Here’s how. Strategize a plan. The whole team must be ready to go to a safe area if it is necessary to retreat. Find a place that provides enough cover to protect yourself. It would be a good idea to move closer to the assist team members in order to obtain help. The assist units are usually concealed prior to the start of the game so the opposing team will not have any idea where the players are heading. Be a team: work together, run together, and fight together. The best protection is always team power. Watching each other’s back can save the whole squad as this helps the team re-engage as soon as they’re back in a safe area. Fire back: to free your selves from the enemy, the team must fire in sync and with great intensity to keep the enemy’s heads down. This could buy time for you to make a successful retreat. Three to four seconds of blasting can be good preparation for retreat. Move with a plan: to repeat, strategize! Retreating does not necessarily mean rushing to safety. While retreating make certain that the opposing paintball players are given a hard time. The whole squad should take turns in returning fire for cover. In the end it is surprising to see that there were multiple shots fired at the opposing team while retreating. They may be running after the retreating team so is it is easy to shoot at enemy when they are in the open. While there is still room for control, end the retreat: not when the whole team can no longer be shot but when there is still a chance to fight the opponent. It will be harder when the enemies cannot to be seen because the damage they could inflict is much worse. The catch! There are special occasions when a team retreats just to lure the enemies into a trap. By keeping the paintball team together and drawing back, it might give the opponent the feeling they are already winning and they might be easier to attack. Once the assisting unit is behind you, utilize speed and shoot the enemies. Ah! The winning moment. Being fired at during a paintball game is not to be used as a reason to retreat. It could be a good chance to change stations and use the advantage for better cover. It might be good to retreat in order to mess up the enemy’s strategies. In cases where you encounter a situation where you or your paintball team have to back down and retreat, the following are effective ways to make retreating more effective, if not successful. When you or your squad needs to move to another position, make sure that this area is far safer as this will be the place where you have to retreat to. Plan ahead so that you will know the ideal place for you and your team to be. Usually, good places to retreat are those that provide cover for the team or is a nearer to the other squad units of your team. It is essential that this area is known by everyone, and all know how to get there. It is also important that all go there together, when such a need arises. When it is time to retreat, retreat all together, retreat as one group. “All for one and one for all” is the best defense you can have. Your group’s combined strength is a force to reckon with when under attack. Imagine if your team was to run off in various directions, you would be unable to watch and protect each other. It is difficult to battle the enemy if everyone is far apart, especially if you and your other team mates are safely nestled in their separate areas. The most effective way to break from an attack is to fire back with an enormous amount of paintball ammunition as this will cause the opposing team to hide and protect themselves from your fire. When the leader of your squad decides to retreat, continue firing all together, hit everything that is moving for about three seconds and then, retreat! Do not forget to fire back and occasionally turn around to check on anyone who may be firing at you. Do this as a group. Keep in mind that retreats are not an opportunity to duck and cover but to make moves that are strategically important to the group’s welfare. Therefore, it should be quick. There is an exception to the “fire when retreating rule.” The act of retreating and not returning any shots is when you or your squad is asked to help your fellow team members. On this occasion, moving as a unit with speed is still very important. Retreating is not easy but it could be the best choice you or your group have to keep your team from losing. Even if you have the latest and the best paintball gun out there, you need to remember that it takes more than a nice gun in order to win in the game of paintball. Although having the bigger stick than the other person will have its advantages, you have to remember that the ultimate deciding factor in winning the game is your skills on using the gun and the environment. The great thing about the sport of paintball is that it brings sportsmanship and solidarity for any individual. It is composed with a wide variety of games and it is very popular among a lot of people from different parts of the world. In fact, this sport is one of the most popular sports in the world. It offers excitement and can definitely pump adrenaline in to your blood stream that will give you that rush you have been looking for. So, just what should you have that will make you play the game better and also help you win more games? The first thing that you need to have is optimism. Like majority of competitive sports, paintball will have the victors and the losers. You have to remember that you can’t win all the games you play. Expect to lose and accepting the defeat is the only way you will excel in the game. After being defeated, just be optimistic and look back at the situation of the game you and your team mates lost. Learn from the mistakes you made and formulate new strategies in order for you and your team to play the game better and increase your chances of winning. Just remember that there are quite a lot more chances for you to score those wins. Experience is very important in this game, which is why you should value it. Whether you won or lost, you should count the experience as valuable as it will teach you a lot of things about the game. Just treat each game as a learning experience where you will be able to make some improvements. You should also remember that paintball is a team game. Don’t act as if you are a one-man army like Rambo as this will only lead to defeat and frustrations for your team. If you and your team really work together as a team, then you will be able to increase your chances of winning. No matter how good you are at shooting the paintball gun, you have to remember that there are also others out there that are as good as you and even better than you. If you want to win, then your team should be able to rely on each other. Also, you need to remember that you should fight. The game of paintball is not a game of hide-and-seek. If you cower in a hole just waiting for your enemy to make a mistake, then it will take out the excitement of dodging enemy fire and returning fire. A time will come that you will experience that the odds of the game will not be on your favor. For example, you may experience that your entire team gets eliminated and you will be left alone. Don’t surrender and never lose hope. There are cases where one person against five still won the game. In this game, you need to keep in mind that it is not impossible to turn the situation around. Training is very important in paintball. Try getting your team to play as much as they can against other teams. Treat the games your team plays as training. When your team does this, then you can be sure that your team will gain experience, learn from it, and become better playing the game. These are the things that you have to remember when playing paintball. You have to remember that firepower is not really that important in this game. Although it may provide you with an advantage, it will all come down to the skills and teamwork. Most team sports require teamwork, skill and planning. This can be seen in the winning teams of sports like basketball, football and hockey. 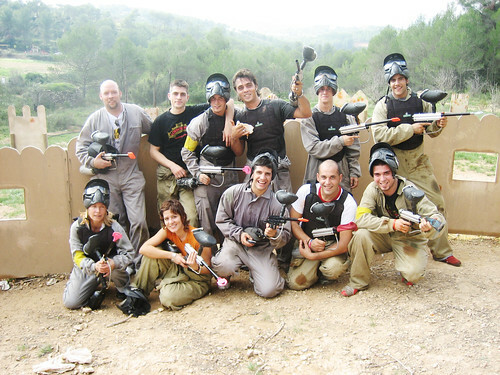 The same approach can be taken to make a very good paintball team. The best way to become a championship team is to know how to play both as a team and individually. It starts at practice where the team will learn to play both offense and in defense. War games are simulated to emulate the real thing. A fort can be made and some members selected to protect it while the other group attacks. After each game, an assessment must be made so that any mistakes made can be corrected to make the team more efficient. Aside from conducting some exercises within the group, other teams can be invited to participate in a practice to sharpen the skills before a tournament. The members should rotate the roles of offense and defense during training exercise as both will have to be used in a real game. Marksmanship should also be part of training. The members must be able to hit both stationary and moving targets since both are necessary in an actual game where both sides have limited ammunition. Since the exercise usually lasts from 30 minutes to an hour, the team should make every shot count. The players should only fire when there is a clear shot available rather than not being able to fire when it matters the most. Stealth is another element needed to win the game of paintball. By being able to sneak up on the enemy first, the team can attack the enemy position before the opposing forces can mount a counterattack. Learning to communicate using hand signals and sounds will prevent the other team from knowing what the team’s plans are. By practicing all of these drills and scenarios in practice, the group will be ready to take on anyone in the league. The secret to winning at paintball is not rocket science; it just takes a lot of practice so that each person knows what to do which will pay off during competition. It takes a lot of guts and character to be a leader in any sport. Even in paintball, where there is minimal physical contact and it can be played by everybody from all walks of life, there are certain qualities needed to be a leader of a paintball team. First, he has to achieve that certain level of respect; the kind where other paintball players, some of them close friends, are willing to follow his orders. This is a feat to achieve since not everyone can bear to take orders from just anyone. He should be a master strategist. In this case, flexibility is a must since he must make the initial battle plan suitable for any kind of battlefield. He must also be courageous, the type of player that will never hesitate to go into the frontline, even if he is protected by his men. He must be a well-liked character, someone who has the ability to communicate clearly and effectively with all types of people. What are the attributes that a paintball commander should have? Experience is one thing that is not gained easily: it takes a lot of time and patience to achieve the kind of experience suitable for a leader. Respect is needed to convince all of the members of a team to follow whatever orders that are needed, dispensed, and carried out. No team player will follow someone he does not like and/or respect. A commander talks with authority and conviction – he can make people listen and take action. A paintball commander must be able to put aside his personal performance for a while to analyze the performance of his team. He should survive almost every battle. He should be able to dissect and identify the flaws of his team and the battle plan whenever things go wrong and have the “smarts” to come up with a better plan the next time around. Like all other participation sports, a paintball leader must be able to inspire other people to perform the best they can. Once this is done, the whole team, not only the paintball commander, will achieve victory.